A very welcoming pub in the heart of historic Worcester. The welcoming staff introduced their delicious beers and did not disappoint on quality. A good variety of beers with atmospheric delight to please all. An arcade table for the kids (yes we had a game of PAC man) and a cocktail bar upstairs. 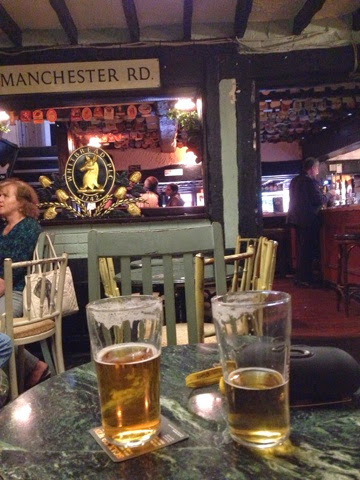 As two young bods in this traditional pub, we are questioned as to the meaning of "three score years and ten" by a friendly local. Lacking knowledge we retreat to the comfy seating area to enjoy our beers. The beer is clear, crisp and very tasty no matter which pint you chose; St George's, Lazy days, Slaters refresher and Valour. At the value price of £2.80 on a Saturday afternoon, what better than to visit The Swan and Two Nicks!? Real ales are a long standing tradition in this country. The influx of European lagers has made the likes of Heineken and Becks hugely popular drinks. But when it comes to a drink of pure Britishness - you can’t go wrong with traditional real ale. There are all sorts of real ales out there. These range from the popular big-name brands found all over the country, right down to locally brewed tipples that people flock from miles around to come and have a taste of. To try every real ale in the country would be something of a challenge. Some people make it their life’s ambition to try as many as possible, heading to all corners of the country in search of new and exciting drinks. If you are thinking about embarking on a sort of real ale quest, it is best to start small and take it slowly. Otherwise there could be some alcohol related mishaps. For many, a good place to start is England’s home of rugby – Twickenham. Twickenham, and its pubs, is rugby through and through. And as a result it is awash with real ales, each one offering something different. To accommodate the hoards of rugby fans that arrive in Twickenham each rugby season, there is a whopping 19 pubs in this relatively small town in the suburbs of West London. Not all of them offer a decent selection of real ales, with many catering for the Friday and Saturday night crowd, which is not known for its cask ale appreciation. But the ones that do offer real ales usually have an impressive selection to choose from. And remember, if you are spoilt for choice and simply cannot decide, most pubs will be happy to offer you a free sample to help with the decision making process. But which are the best of the best in Twickenham? The Old Goat is a little out of the way, located about a ten minute walk from the familiar high street that most rugby fans won’t leave all day. But if you have a little time on your hands, make the ten minute walk to The Old Goat. It is more than worth the time it takes to get there, as this pub offers one of the most extensive beer and real ale menus in Twickenham. The fridges are stocked full of rare European lagers not seen in most pubs, and on the bar there are so many real ale taps you might have a mild panic attack. If you want to stay a little closer to the high street, and the rail station, take a wander down to the river. The White Swan is located just off the high street, and overlooks some of the most beautiful parts of the river Thames. Real ales on offer here include a couple of other locally-brewed tipples. If you prefer a dark-coloured, malty ale then try Original, which offers a rich, chocolaty flavour. We want your Reviews and Previews. - The subject of the email will be the title of your post. - The content of the email will be content of the blog post. - Any attached images will be the accompanying images for your post. The old adage "out with the old in with the new" applies very aptly with Theoc House. A very bad Pub Co premises being transformed into a new and rejuvenated Freehouse. Not long opened now but starting to become more and more busy and one of the talked about pubs in the town. By all appearances it could be mistaken for a just another trendy coffee house rather than somewhere that would serve a good pint of real ale. However being a Freehouse they serve both to a very high standard, which works very well along side their all day food menu's. Its has a great mix of food and drink that is new and very original for Tewkesbury. Severn Vale Brewing Co's Severn Sins is a regular and you are also likely to find a complementing but contrasting pint of Bath Ales Gem being served. They have swapped the Gem to Goff's Jouster also and being a Freehouse I hope to see the beers regularly change over the next few months. Independently owned by James and Simon you will always be welcomed with a smile whatever the occasion. A new take on what a pub / bar should be they have a great selection of books and board games to keep both the young, and the young at heart amused. As their Facebook page states "A friendly, neighbourhood cafe bar located in the heart of Tewkesbury. Serving coffee, drinks and a great selection of food throughout the day. Use us for whatever you see fit, a morning coffee, brunch meeting, ladies lunch, afternoon chill or romantic meal for two." Next time you are visiting Tewkesbury definitely worth a visit for a spot of lunch or evening meal, and definitely try both of their real ale's. I'm sure this will soon become a very good example of where the big Pub Co's are going wrong and how Independently run pubs can succeed. Its good to see a pub opening in Tewkesbury that does things differently................. Jazz night tonight!!!! 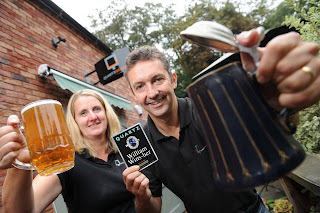 A Brand New Beer Bonanza For Staffordshire! This year’s Stone Food & Drink Festival promises to be bigger and better than ever, with the inception of a brand new event for beer-lovers – The Titanic Brewery ‘Best of Staffordshire Beer Festival’. With over a dozen Staffordshire brewers taking part, including Blythe, Enville, Burton Bridge – and of course, Titanic - this new addition will make The Stone Food & Drink Festival the go-to event for ale lovers. Taste of Staffordshire members, Titanic Brewery, have attended Stone’s premier celebration of all things gastronomic for the past three years, and this year have invited fellow Staffordshire brewers to come along and celebrate the county’s fantastic and distinctive ale offer with them. Dave Bott, Director at Titanic Brewery, said: “We have always thoroughly enjoyed being a part of the festival, but this year we decided that we wanted to look at the bigger picture and invite other brewers to come and get involved. With a huge variety of beers, from light to dark, bitters to stouts, and various strengths and styles, this year’s Stone Food & Drink Festival, from Friday 30th September – Sunday 2nd October is not to be missed for anyone with an appreciation of ale! Now in its seventh year, The Stone Food & Drink Festival continues to be sponsored by Taste of Staffordshire, the county’s foremost mark of taste and quality for local food and drink. This year the festival will take place on 3rd, 4th and 5th of February 2011. This festival has been going for quite a few years now. It is most enjoyable as it always falls on the same weekend as the start of the Six Nations Rugby. Nothing better than a good game of international rugby and a great pint of beer (or cider depending on your preference). A great mixture of Winter Ales and Cider this year there will be 72 barrel's in total. The beers are housed to the left as you enter then its best to move swiftly into the main hall for standing room and a limited number of seats. Beer tokens are purchased on your way in and there is normally and offer for Glass, Entry and Beer tokens for £10. Saturday 5th - 11am-11pm (Membs £1, non-membs £2). The number of barrels 72. Entry to the hall will be limited to 300 persons at ALL times. CAMRA Members will be asked to show their Membership Cards at ALL sessions. A Staffordshire brewer is raising a glass to the Royal engagement this weekend with its newly named William Wins-Her special ale. Quartz appealed for a wedding inspired name for the beer on its Facebook and Twitter pages after the Royal announcement was made earlier this week. Winner Anna Hewitt, was one of hundreds of people who suggested names for the special edition beer via the social networking sites. She will receive a five litre mini cask of the beer, which is brewed at the Quartz Kings Bromley brewery. Quartz master brewer Julia Barnett said Anna's winning entry was chosen because it immediately stood out from other entries due to its originality. "It was a really tough decision to choose the winning name as we had some fantastic suggestions from both Facebook and Twitter," she said. "We were delighted with the level of response and the amount of thought people had put into their suggestions, considering they only had twenty four hours to enter." William Wins-Her is a 5.2%, full bodied, hoppy beer and will be available to buy this weekend from the Quartz shop at the Heart of the Country Village, just off the A38 in Lichfield. For more information on Quartz Brewing, visit www.quartzbrewing.co.uk ,follow @quartzbrewing on Twitter or become a fan of Quartz Brewing on Facebook. The Glass House, May Hill, Longhope, GL17 0NN. A very traditional pub that does everything just how a village pub should. The beers are poured straight from the cask, just like you would find at most CAMRA beer festivals. They normally only have two ales on at a time, Butcombe and Doom Bar. Being straight from the cask there is no added fizz so there is no sparkle or gas added to affect the flavour and texture of the beer. Ale how it was traditionally served. The food menu is based around traditional meals these are cooked and presented extremely well. Meals start from around £8 and are generally around £10, I believe the fillet steak was the most expensive at £20 but the food is well worth it with generous portions. I just spent a rather pleasant couple of days staying at one of the finest real ale pubs I've ever been in. The Bird In Hand (http://www.birdinhand.co.uk) is a beautiful 14th Century inn, just outside Reading. The food is outstanding, the rooms are nice and at a reasonable rate, and the staff are friendly and welcoming. But now to the important part...the beer. The inn has won CAMRA Berkshire's Pub of the Year, and it was well-deserved. It has 5 pumps, and while I was there had a good selection. They've recently decided to dedicate one pump to Brewdog's fine selection, although at the moment they have 2, plus Brewdog's 77 lager on tap as well. I started off with Munich Beer, a lovely German-style beer, slightly sweet with a toffee finish. Very much a session beer, I could drink this all night. This was followed by Ascot Ales Oktoberfest - much the same, but with more malt. The following evening, 2 beers had finished, and had been replaced with Brewdog's Edge, and Cliff Quay's Tolly Rodger. I tried a sample of Brewdog's Edge - very, very dry mild ale, deep scarlet. Too dry for me, but a friend was impressed. Cliff Quay's Tolly Roger, on the other hand, was a very drinkable golden ale, with strong honey and citrus flavours. There are also usually a good selection of bottled beers (did I mention they like Brewdog? Just about every Brewdog bottle is available) and others, such as Ascot Ale's Alligator. I simply cannot recommend this pub enough, and if it wasn't for the fact that its 400 miles away, I would gladly make it my local.